Business hours: Daily; 11.00am to 9.45pm. Hartamas Shopping Centre and Fahrenheit 88. CHINESE food is best enjoyed hot and nothing beats dishes served in hot stone bowls that retains the temperature over time. Restaurant chain Room Eighteen under the Tai Thong Group is offering customers new items served in these bowls, including ice-cream that comes in a hot stone but can be switched easily to maintain its coldness. Room Eighteen executive chef Wo Hoi Ming from Hong Kong said the idea for this ‘Sizzling Hot Stone Series’ was to provide customers with a fresh dining experience. “The dishes are usually more fragrant when served this way. Customers can chat over their meals and not worry about their food turning cold,” said Wo. There are seven dishes under the hot stone menu. The Fresh Frog Meat Congee (RM15.80) is a steaming hot bowl of porridge filled with frog meat slices and handmade youtiao or fried Chinese crullers. 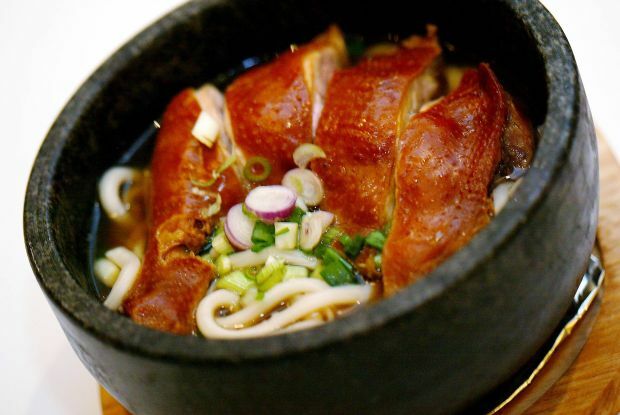 Next was the Soy Sauce Chicken Drumstick in Udon Soup (RM14.80), where Japanese Udon noodles simmered in broth are served with Hong Kong-style whole soy sauce chicken drumstick. The chicken was enjoyed for its flavourful meat but the chefs may want to braise it longer to ensure a thoroughly cooked chicken. The Spring Chicken and Wantan Soup (RM16.80), said Wo, was originally a Shanghainese dish but he has given the soup a twist. Tempting creation:The Curry Chicken Served with Deep-Fried Puff Pastry. Notice the title ‘chimney’ on the side to let the air out. “The soup is rich and creamy as a result of double-boiling with pork leg, among its ingredients, for about six and a half hours. It is packed with nutrients,” he said. For rice, there’s the Hong Kong Style Fried Rice with Cut Chilli and Minced Garlic (RM12.80). Unlike your usual fried rice, this version is slightly spicy and the rice grains are devoid of any moisture. It comes with fried minced pork and garlic as well as toppings of dried anchovies for that extra crunch. The Koh Samui Style Braised Shark’s Fin Soup (RM16.80) is thick in texture with ingredients like shredded chicken, shredded crab meat and vegetarian shark’s fin, all braised for over eight hours. Also served were the Stewed Mixed Vegetables with Vermicelli (RM13.80) where vermicelli is thrown in with assorted fresh greens into a hearty bowl of soup, as well as the Curry Chicken Served with Deep-Fried Puff Pastry (RM14.80). 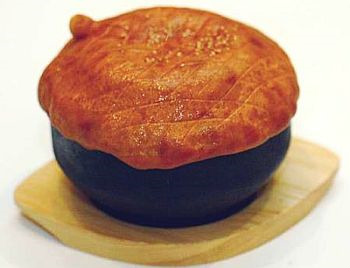 The presentation is unique as the piping hot curry in the bowl is sealed in with a layer of pastry. “The curry chicken is cooked a la Portugese, which is less spicy than the local curry. “The pastry was the most difficult to make as raw pastry often sinks due to moisture. “So we had to experiment by mixing different types of flour locally and from overseas to get the desired texture,” said Wo, adding the pastry was baked later and drizzled with oil. Dessert was the Icy Snow White Coconut Pudding on the Rock (RM9.80) where coconut jelly pudding is topped with a scoop of homemade vanilla ice-cream and strawberries. In celebration of these new hot stone dishes, Room Eighteen is running a ‘Snap, Vote and Win’ contest exclusively for their Facebook fans. Participants can take of photo of their favourite hot stone dish and upload it onto www.facebook.com/room18.msia and include a reason why they love that dish. Contest ends Aug 31, and voucher prizes of up to RM888 and cash of RM1,000 await winners. Customers who order any one of the seven hot stone dishes above need just top of RM1 for a drink of either Chilled White Fungus and Dried Longan, or Honey Lemon, RM2 for a bowl of Minestrone Soup, or RM5 for the Icy Snow White Coconut Pudding dessert.